THE DOCTOR AND THE GIRL is an MGM film before it’s a Curtis Bernhardt film — no glimmers of expressionism here. And what Fiona called “the worst title ever” — certainly the most generic. But it does stretch a bit at the limits of what can be said about the world in an L.B. Mayer production. Arrogant junior doctor Glenn Ford, product of a tyrannical surgeon father (Charles Coburn NEARLY in KING’S ROW mode) falls for and is humanized by Janet Leigh, who is of humble origins, mans a taffy-rotating mechanism for a living, and has a lung abscess, though you would never know those things to look at her. Surprisingly, he sacrifices his dream of neurosurgery to become a slum doctor, and finds happiness. It’s the sacrificed dream bit that’s surprising — most Hollywood confections would find a way to give him his heart’s desire twice over. Meanwhile. his sister (Gloria DeHaven) gets pregnant out of wedlock, which means she’s sentenced to death by the Hays Code. What’s unsettling is the glimpses the film offers us of Bellevue — Leigh only survives the place because Ford pulls strings and gets her the top surgeon — it’s made pretty clear that with a regular doctor she didn’t stand much chance. If she hadn’t been young perky and white, what chance would she have had? What chance do these characters have? When students first start editing dialogue scenes in their films, often their first instinct is to simply show the person talking. While Jack Webb makes this work in DRAGNET, film and TV show, it isn’t usually an expressive or involving approach, since it deprives us of a lot of emotional connection which comes from watching the listener rather than the speaker. An editor needs to be like a mind-reader, predicting what the audience wants to see in order to follow the emotional flow of the conversation. 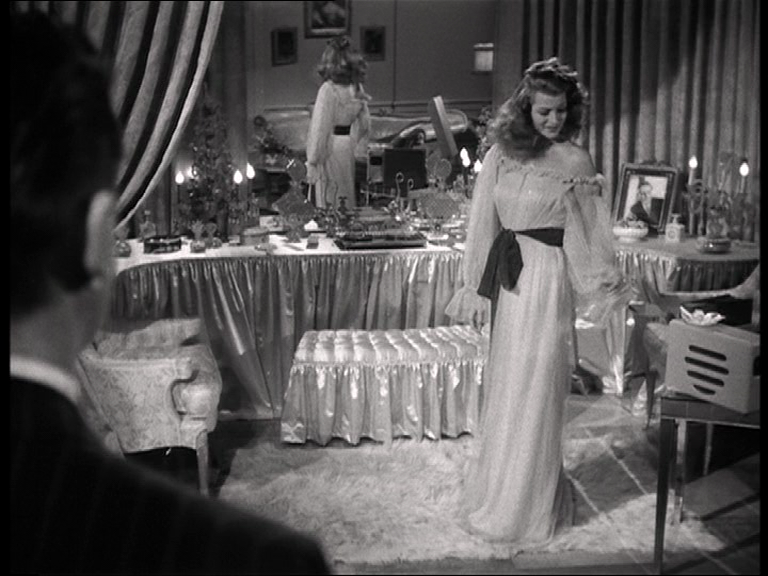 To prove that the person speaking need not be the person visible, I often show students Rita Hayworth’s first appearance in GILDA, which is an exemplary scene in all kinds of ways, not least of which is the way a scene involving a newly-wed husband and wife and a friend is arranged so as to practically exclude the husband altogether. While appearing to assemble his material in a conventional, commonsense manner, director Charles Vidor (and editor Charles Nelson) actually lead the audience to realise very strongly the undercurrent of attraction that hubby is unaware of. One effect of using this clip as a teaching aid is that poor George MacReady’s exclusion from his own bedroom scene becomes increasingly hilarious once your attention is drawn to it. 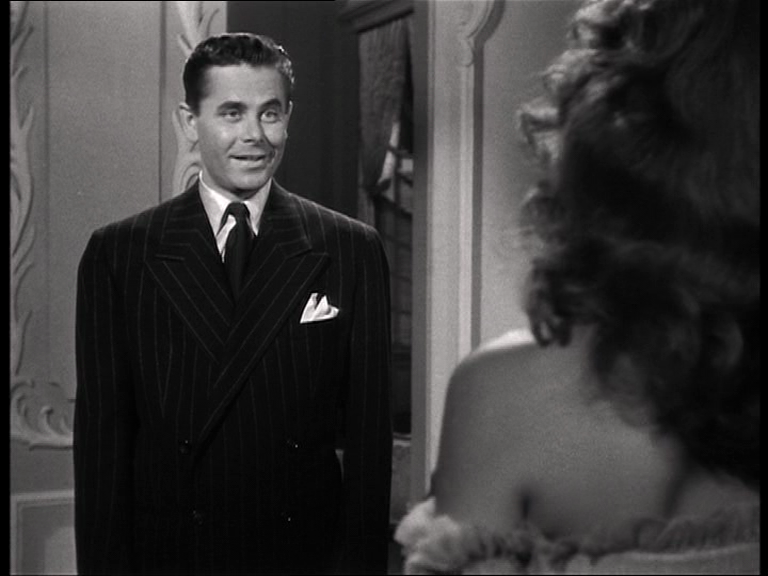 Before we even get to the boudoir, Vidor uses a camera move to push in on Glenn Ford, who matters here, and exclude MacReady, who apparently doesn’t. Of course, the real purpose for the track-in, or maybe the alibi, is to emphasise Glenn’s emotional reaction to the unexpected presence of a woman. Glenn and George have been very close, you see. Rita’s first appearance, with the spectacular hair-flip, is striking for other reasons. She gets a big close-up, deliberately boosting her over the two menfolk, who have just been seen in a knee-length medium shot that makes them virtual pygmies in her presence. Her appearance has IMPACT, and it’s a purely cinematic creation: if you were in that room, you’d have seen her long before she enters frame from below like a surfacing shark, and you’d have seen her in the same kind of distant mid-shot as the boys get. The effect is WOW. No wonder Glenn has to grab the door frame for support. And note Rita’s eschewing of femme fatale smolder in favour of a googly-eyed ditziness that’s much more effective for being indirect. A splendiferous wide of the boudoir in which we get a full-length Rita x2, an O/S of Glenn, and no sign of George. So irrelevant to this love scene that he doesn’t even cast a reflection in the vast dressing table mirror. Rita now advances into an O/S midshot, and when we cut to the logical reverse of that, her great head of hair is completely obscuring our view of George. And we find that we don’t mind that at all. Now a long dialogue can play out, most of it between George and Rita, but what the visual scheme is telling us is something very different — this is a scene about Glenn and Rita. 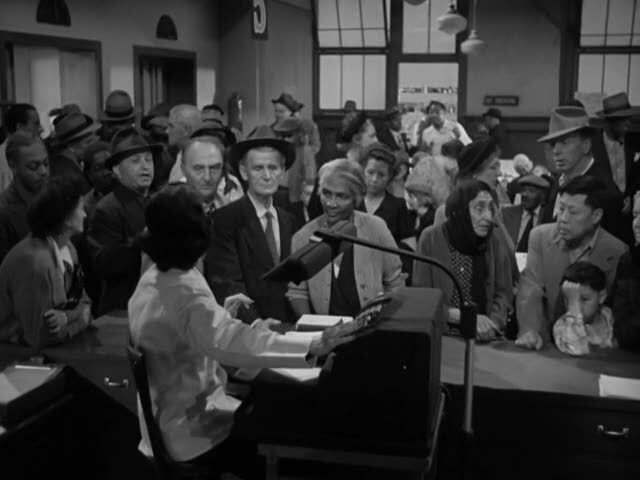 The scene is cut exactly as if Glenn were doing the talking — you can amuse yourselves by imagining George’s voice as being telepathic communications from inside Glenn Ford’s head. Then a big close-up of Rita, simmering away, all sultry and smoking, while Glenn and George converse meaninglessly. You can imagine this bit as being about the voices in Rita’s head. It won’t get you anywhere, but you can totally do it. Finally Glenn gets a close-up, very slightly smaller than Rita’s (I blame the hair) but basically a match. George is still AWOL, literally phoning his performance in for all we know. He should’ve got a special award for giving a radio performance in a feature film. Vidor continues in a shot-reverse-shot pattern that would seem entirely conventional except that one half of the conversation has been usurped by the silent, moody Mr. Ford. This is a classic example of the conventions of film-making being used in a defiantly unconventional way for expressive reasons. Vidor cuts back to the MS of Ford and some strange guy we’ve never seen before — oh wait, it’s George MacReady — crashes the shot and swoops in to kiss Rita. But Vidor isn’t through humiliating the oblivious dope: perversely, he uses shot-reverse-shot cutting on Ford and Hayworth to make them interact during the kiss. 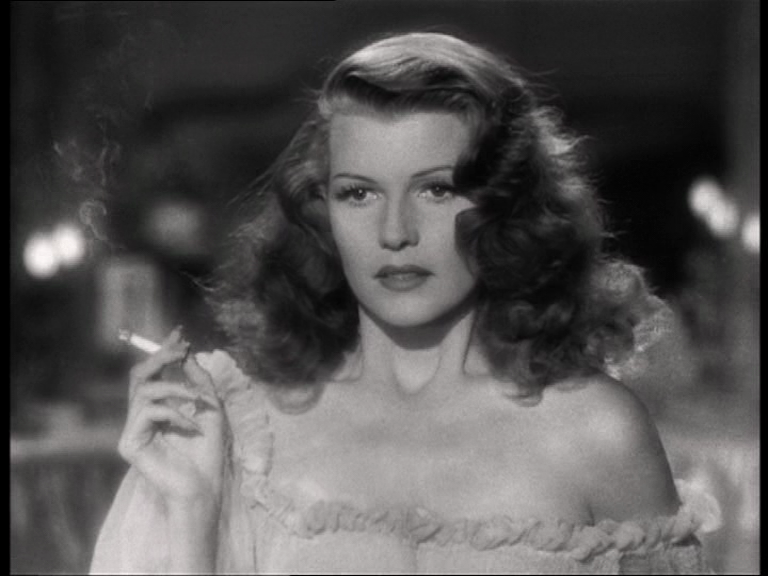 MacReady may be owner of the lips descending on Hayworth’s expensive face, but it’s Ford she’s thinking about. Further sadomasochistic intrigue oozes in as she calls him “hired help” — Glenn’s reaction shot here — *GULP* — is priceless, as he swallows his pride like a bad oyster. In the words of Bart Simpson, if you use slomo, you can actually see the moment his heart breaks. Glenn’s shoulder frames the next three-shot, where George again has his back to us. A fresh angle allows him at least a profile, salvaging some of the poor guy’s dignity, but he’s still way off to the side, with Ford obviously the subject of the shot and Rita’s cascade of hair taking up more screen space than either man. Then Glenn slopes off, George bounding after him (unusual to see this actor so puppylike). Entertain yourselves one more time by abolishing perspective and picturing the back of Rita’s head as being actually bigger than all of George MacReady. Now you have an unforgettable and accurate image of their wedding night. George leaves, and Rita caps the scene with a brooding, smoky close-up and another swish of her hair, a sort of bookend to the action. Dedicated to the memory of Bert Eeles, my editor on CRY FOR BOBO, who died last week.